Hydrotherapy is a warm water-type bed with three rotating jets for your neck, mid back, and lower back. Patients remain completely dry while the jets provide pressurized spray that promotes the relaxation of their achy or tired muscles. The water treats patients joints, soft tissues, and muscles allowing them to experience relief from many types of ailments. 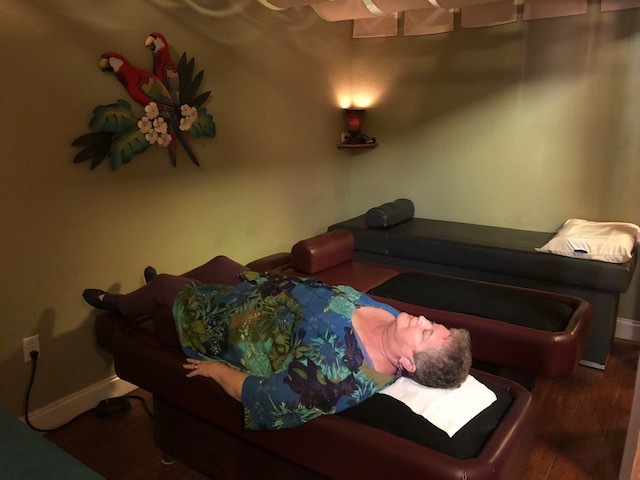 The hydrotherapy bed is a convenient, dry, full back massage that uses rotating jets and pressurized water to gently massage our clients into a blissful and stress-free composure. Most patients find the treatment to be both comfortable and relaxing. Patients experiencing symptoms such as muscle tension, stiff joints, or muscle spasms find this therapy to be relieving and beneficial. Hydrotherapy improves blood circulation. Improved blood circulation allows more oxygen to enter the blood and organs which thereby allows many of our body’s processes to function more smoothly and correctly. Hydrotherapy has also been known to reduce the pain caused by tension in the muscles. Physiological stresses on the body can keep our muscles contracted for extended periods. These contracted muscles feel “tense” and uncomfortable. Hydrotherapy can reduce the stress placed on the body’s muscles and allow the tension to melt away. Muscle stiffness is also a common ailment treated with hydrotherapy. Tight muscles can cause a limited range of motion in parts of the body. Through this treatment, patients can begin working towards the full range of motion to which they are accustomed and leave the rigidity of their muscles in the past. Hydrotherapy also can help battle fatigue in the body. Water is a warm, natural, therapeutic resource and its relaxing nature can help revive even the most exhausted of bodies. International Chiropractic Center is Central Florida’s best and most dedicated center to receive all of your chiropractic and hydrotherapy needs. Dr. Newton’s has over 30 years of experience as a Chiropractic Physician and as a Registered Nurse. As a member of both the American Chiropractic Association and the Florida Chiropractic Association, Dr. Newton makes sure all of his practices are relevant and cutting edge in the field. A Diplomate of the National Board of Chiropractic Examiners, Dr. Newton uses his know-how and experience to holistically treat whatever is ailing you to the best of his ability. Whether it’s pain relief, discomfort, muscle tension, stiffness, stress, or anxiety, International Chiropractic Center is Orlando’s answer to finding an effective treatment plan.